Raymond H. Boone Sr., the colorful, principled and feisty founder, editor and publisher of the weekly Richmond (Va.) Free Press, died Tuesday at his Richmond home after battling pancreatic cancer, his wife, Jean Boone, told Journal-isms. He was 76. Boone was on the job until nearly the end, said his daughter, Regina Boone, a photographer at the Detroit Free Press. "He knew everything that was going on. He was talking about what the headlines should be" for last week's edition, she said. When Journal-isms reached Boone by telephone in February, he was editing the publication from his hospital bed. Jean Boone, who co-founded the Free Press and is the paper's advertising director, said, "For the moment, at least, I will assume the leadership role." Boone had a rich history with the black press and taught journalism at Howard University for nearly nine years before founding the Free Press in 1992. According to his bio, "The Poynter Institute for Media Studies in St. Petersburg, Fla., honored him for his 'outstanding teaching in journalism.' Black Enterprise magazine once hailed his brand of journalism as a model for the survival of black newspapers in America. "Prior to joining the Howard faculty, Boone was editor and vice president of the Baltimore-based Afro-American Newspaper Group. 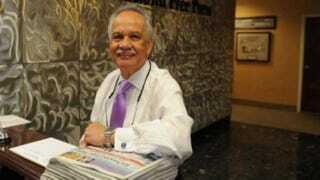 Time magazine has credited him with bringing 'sophistication and verve' to the black press. He also was a reporter for the Norfolk Journal and Guide. He also has daily newspaper experience, having worked as a reporter for the Quincy (Mass.) Patriot-Ledger and the Suffolk (Va.) News-Herald. "While serving as a Pulitzer Prize juror on two separate occasions, he spearheaded a successful effort that resulted in the placement of African-Americans and women on the Pulitzer Board at Columbia University. . . ." The bio also declared, "The Free Press, under Boone's leadership, is the most honored newspaper in the Richmond region." The Virginia native took seriously his way of speaking truth to power. Last year, Boone announced that he had stopped using the term "Redskins" in his paper because it is "racist." He challenged as discriminatory the spending practices of the Washington Redskins NFL team, and later called for the ouster of the NAACP's national chairman, Roslyn M. Brock, when he said she supported her employer, the Bon Secours Health System, which partially owns the Richmond-based Washington Redskins Training Camp. When Glenn Proctor was named the first African American editor of the Richmond Times-Dispatch in 2005, Boone was skeptical, saying that "at best, Proctor is a token there. Media General [the owner] is in charge, not Proctor. They just want to put him out front for image purposes." Boone was proud when, in 2011, Free Press photographer Sandra Sellars became the first woman and first black newspaper journalist to photograph the Virginia Supreme Court's investiture. Sellars covered the ceremony for Virginia Supreme Court Justice Cleo E. Powell as the first black female justice in the court's 232-year history. "Chief Justice Cynthia D. Kinser's approval of Sellars represents a major victory for the decade-long Free Press campaign to change the court's guidelines that previously barred photographers from the Free Press and other Black-owned newspapers, as well as those from non-dailies," Jeremy M. Lazarus wrote then in the Free Press. "Earlier, the chief justice, in response to another Free Press campaign, expunged sexist references from the court's website." That same year, Boone allowed Occupy Richmond protesters to camp in his yard next door to the mayor's house. He was slapped with a zoning-violation notice, but Boone ignored it, saying, "It's vague, it's contradictory, it's counterproductive." The Free Press has not yet published a Web edition, instead posting a facsimile of its print edition. But Boone said he purchased all the wire services available to him to give readers the most complete coverage, and insisted on high ethics. When his colleagues in the National Newspaper Publishers Association took a government-sponsored trip in January to Morocco, Boone broke with those who denounced this columnist for reporting on the ethical issues involved. Boone told Journal-isms that the Free Press pays for tickets to local NAACP events. Even when former President Bill Clinton held a meeting in Toronto to discuss relief after the disastrous 2010 Haitian earthquake, the Free Press insisted on paying its own way. "What is happening is pervasive," Boone said. "Using sponsorships and opportunities" to control people. "Raymond Boone was a singular figure in the history of journalism and politics in Virginia. His was a life devoted to justice, equality and a well-informed public discourse, and I know that commitment will live on thanks to his leadership at the Richmond Free Press. Dorothy and I are keeping Raymond's wife Jean and all of their family and friends in our prayers today as we mourn the passing of a true Virginia legend." "The passing of Ray Boone really marks the end of a personality who was an integral part of our city. His stalwart support for the black community, for economic justice and fairness paved the way for change in so many ways. As Founder/Editor/Publisher of the Richmond Free Press, week after week, he offered many a window into the world of black Richmond. He provided visibility for people who might otherwise be invisible to some. He voiced concerns and desires in ways that might not otherwise have gotten expressed. "When I think of Ray, the word that comes to mind for me is 'crusader.' It's clear to me that Ray Boone was a giant of a personality that won't soon be forgotten. My thoughts and prayers are with his family and loved ones during this time of loss." Almost a third of television news directors — 31.2 percent — say they ran news on another local or nearby TV station, according to a survey released Monday by the Radio Television Digital News Association. "Generally, the bigger the newsroom, the more likely to have the station supplying news to other places," Bob Papper, professor emeritus at Hofstra University, said in his 20th annual survey for the association. "Fox affiliates were more likely to be involved with cable channels but less likely to be involved with another TV station in the local market or a radio station. Stations in the Northeast were noticeably more likely to be involved with another local TV station, a cable channel and TV in another market than stations elsewhere. "The small number of 'other' included a local newspaper, company-owned affiliates elsewhere, subchannels, and one that supplies video to gas pump monitors at local service stations. The issue of sharing services with other stations has become a contentious one before the Federal Communications Commission, which last month barred most so-called shared service agreements or joint services agreements on a 3-2 vote. Bob Butler, president of the National Association of Black Journalists, has contended that the sharing of news between stations can cost journalists jobs. Broadcasters maintain that this is the only way some stations can stay in business. Butler wrote in March, "When there are fewer newsrooms, jobs are cut, normally leaving fewer opportunities for all journalists to find work. Viewers for the different stations get the same news delivered by the same people, limiting the opportunity to hear different viewpoints. For those who work in these newly 'shared' newsrooms, there is more work and less time for in-depth or investigative reporting. "There are also fewer management jobs, leading to less diversity among those who make decisions on news coverage and hiring. . . ."
Papper wrote in his report, "The latest RTDNA/Hofstra University Survey continues to show that the TV news business isn't limited to TV anymore, but the numbers also show a stabilization in the outside reach of a TV newsroom. The percentage of stations involved with other media slid about two and a half points from last year to 75.9%. Still a very high number. . . ."
In another section of his report, Papper wrote, "Call them one-man-bands, multimedia (MMJ) or backpack journalists — their use has been growing over most of the last six or seven years — until last year. "Last year, the numbers really didn't change; this year the relentless, slow march continues. The use of one-man-bands had been going up about 3 points a year. Last year, it was unchanged, but this year the use increased by around 5. So we're back to an average increase of close to 3 points per year overall. . . ."
A 68-page petition opposing Comcast's proposed acquisition of Time Warner Cable has been filed with the Justice Department on grounds that it "would further institutionalize business and cultural norms in this new mainstream media that would substantially diminish and ultimately silence the public voice of minority citizens." The petition was signed by activist Charles E. Tate, journalists Paul Delaney and Juadine Henderson and eight others, including Richard America, economist and author; Dianna Dudley, compliance officer for an international banking and financial services company; and Lucenia W. Dunn, former mayor of Tuskegee, Ala.
As Joe Flint wrote last month for the Los Angeles Times, "If approved, the more than $40-billion deal would combine the nation's top two cable providers and create a pay-TV and Internet behemoth. The Federal Communications Commission and Justice Department are reviewing the sale to determine if it serves the public interest and doesn't violate antitrust law. . . ."
The petition urges not only that the acquisition be denied but also "that divestiture of one-third of their major market cable assets by Time Warner and Comcast be imposed to increase competitiveness, reduce monopolistic market power and expand content diversity of the mainstream media market; and to advance and protect the long-term public interests of American citizens and consumers as well as the constitutional foundations of the American democracy. Further, that the divested assets be offered for purchase by African Americans, Hispanics, Native Americans and Asian American citizens." "B. Require Comcast to include a new national black television network news service in the network program line-up for each of its cable systems on a 'must carry' basis. "C. Require Comcast to contribute sustaining operating budget finds for the Maynard Institute [for Journalism Education] programs to train future generations of African American, Hispanic/Latino, Asian American and Native American journalists for positions in minority owned cable systems and mainstream media newsrooms. . . ."
"Maya Angelou's family has planned a private memorial service in Wake Forest University's Wait Chapel for 10 a.m. Saturday. Wake Forest University officials made the announcement Monday morning," Meghann Evans reported for the Winston-Salem (N.C.) Journal. "Angelou, celebrated poet, actress and activist, died Wednesday at her home in Winston-Salem after a long illness. She was 86. . . .
"The university said the family decided to have a closed service for only family and friends, because of limited seating capacity. Wait Chapel seats 2,250 people and has hosted presidential debates and other prominent events. "Wake Forest will stream the service online for the public at go.wfu.edu/angeloumemorial." Evans also wrote, "Last week [Oprah] Winfrey told Entertainment Tonight that she would be speaking at the memorial. Winfrey and Angelou were close friends. "Winfrey tweeted Sunday that she was sitting at Angelou's kitchen table. "Angelou served as the Reynolds Professor of American studies at Wake Forest from 1982 until her death. . . ."
The university posted a notice for media: "Every news organization planning to attend must have credentials for every individual who will be on campus on Saturday, June 7. Credentials must be requested online only through this form by Wednesday, June 4 at 5 p.m. . . ."
When Google released figures last week showing the demographics of its workforce to be 61 percent white and 70 percent male, the figures were widely reported as showing a lack of diversity — despite a work population that was 30 percent Asian. "Google is thus less white than the typical American company. White men are probably slightly overrepresented; assuming that the 30 percent number it gives for women Google employees worldwide carries over to the U.S. (the article gives no separate number for U.S. women Google employees), white men are 42 percent of the Google work force, and 35 percent of the U.S. work force — not a vast disparity." If the aim is to reflect the demographics of the country, Volokh added, "Google can only accomplish that by firing well over three-quarters of its Asian employees, and replacing them with blacks and Hispanics (and a few whites, to bring white numbers up from 61 percent to 67 percent). "Of course, it would be appalling for Google to fire Asians in order to have some sort of demographic match-up with the country, or even stop hiring Asians or hire fewer Asians for that reason. I think it would be equally appalling for it to fire, stop hiring, or hire fewer whites as well. My point is simply that, if one thinks that the problem is lack of 'reflecti[on of] the demographics of the country,' 'white[s]' aren't the problem. "This is part of a phenomenon I have long observed, under the label of 'how the Asians became white.' It's not just that Asians are being treated like whites for purposes of race preferences, with some institutions deliberately setting lower standards (or creating a 'plus factor,' which is the same thing) for black and Hispanic applicants than for Asian and white applicants — instead, people sometimes actually call Asians white (mostly unconsciously, I suspect) . . ."
"In spite of an increased number of college educated African-Americans, unemployment rates for this group is also disproportionately higher in IT, regardless of education level." Professional Development Network describes itself as an Internet software and services company specializing in diversity recruitment resources for corporations, government agencies and job seekers. "When I wrote an opinion piece on May 21 basically questioning an incredibly misleading piece by Nate Cohn of The New York Times' 'Upshot' blog, I never would have thought that 1) Latino Rebels would still be covering the story; 2) The Times would not yet respond to my emails about Cohn's reporting; and 3) Cohn would write another piece defending his initial piece," Julio Ricardo Varela wrote Monday on his Latino Rebels site. "But that is where we are as of this morning. Cohn and his editors have forged ahead with the following post, 'Pinpointing Another Reason That More Hispanics Are Identifying as White.' Ironically, Cohn's latest piece (which once again does not include any actual reporting, just citations to previous studies) used a HuffPost entry by Manuel Pastor which was actually highly critical of Cohn's overgeneralizations. . . ."
Manuel Pastor, HuffPost LatinoVoices: Are Latinos Really Turning White? Photographer Marilynn Yee Retires After 37 Years of N.Y.
"New York City, 1977. Fires raged through the Bronx. Son of Sam was on the loose. Murders were almost as common as street fights and Times Square was dirty, in every way possible," David Gonzalez wrote May 22 for the New York Times Lens blog. "Marilynn K. Yee left sunny California for this? She had come to New York, all of 27 years old, to be a staff photographer at The New York Times. Among the first women on the photography staff, as well as the first Asian, she had left behind California, where she had been raised, and where she had worked briefly at The Los Angeles Times. "Working the night shift, she did it all, hopping on the subway with her gear at all hours. One night she dashed off to Harlem to cover a double homicide. Her parents, who were visiting, were supposed to call her at work. She told the clerk that whatever happened, please don't tell them where she was. "When she returned to the paper, the clerk said her parents had called. "The paper and her parents have changed since then. So has Ms. Yee, who went on to cover both World Trade Center attacks, being part of the team that shared the Pulitzer Prize in 1994. Now, after 37 years, she is retiring. This is her last day. . . ."
Kudos to Gretchen Morgenson of the New York Times, who wrote in her "Fair Game" column in the Sunday print edition about companies that reneg on promises to diversify their corporate boards. One investor pushing for change is Calstrs, "the pension fund that invests on behalf of California's teachers. In recent years, its officials have pushed for diversity on corporate boards, filing 35 shareholder proposals at companies asking for action on the issue. At least 14 have responded by appointing either a woman or a member of a minority. "Sometimes, as is common among institutional shareholders, Calstrs agrees to withdraw a proposal from proxy materials after extracting a promise from the company to improve its governance practices. "Three years ago Calstrs approached Skechers about increasing the diversity of its board. After the company agreed to add a formal diversity policy to its nominating committee charter, Calstrs withdrew a proposal that it was hoping to put to a shareholder vote. But Skechers still hasn’t changed its policy. . . ."
"The dramatic shift in popular opinion that is expected to lift a former army chief to president of Egypt traces, in part, to an incident outside a TV station last year," Matt Bradley wrote last week for the Wall Street Journal. "One night last June, long before Field Marshal Abdel Fattah Al Sisi was seen as presidential material here, the news directors of six satellite news channels huddled in an office to discuss growing protests outside by backers of Mohammed Morsi, the Muslim Brotherhood leader elected president after the Arab Spring uprising. "The news directors say they were terrified. Islamists enraged at the stations' criticisms of Mr. Morsi had surrounded the office park that housed their TV offices, intimidating reporters who came and went. "The protesters 'were saying "We will kill you." They started throwing Molotov cocktails at the gate. So this was terrorism,' said Albert Shafik, news director of a channel called OnTV. "The language in broadcasts watched by millions proved a pivot point in Egypt's circuitous development after the Arab Spring, from nascent democracy to a new embrace of leadership by former generals. "Mr. Morsi, elected in 2012 in the first free and fair presidential election Egypt had held in decades, now sits in prison, facing capital murder charges. . . ."
"The U.S. Supreme Court on Monday refused to take up the issue of legal protections for journalists, rejecting an appeal from a New York Times reporter who is fighting a subpoena that seeks his testimony about a confidential source," Brent Kendall reported for the Wall Street Journal. "The court, without comment, denied an appeal by journalist James Risen, whom prosecutors have subpoenaed for information about a source for his 2006 book, State of War: The Secret History of the CIA and the Bush administration." Kendall also wrote, "New York Times Executive Editor Dean Baquet said, 'The court's failure to protect journalists' right to protect their sources is deeply troubling.' . . . "
Researchers from East Carolina University studying health, weight and fitness messages in Ebony and Essence magazines agreed with previous conclusions that "framing weight, food, and fitness/exercise as wellness issues is likely to resonate with African-American women, and that using opinion leaders within the community, including spiritual leaders, may affect positive change" [PDF]. Linda Kean, Laura Prividera, John W. Howard III and Dinecia Gates reported their findings in the Spring 2014 issue of Journal of Magazine & New Media Research. "Thailand's main press association said Monday it is gravely concerned that undercover police appear to be posing as journalists after a video circulated showing a man with official press ID arresting an anti-coup protester in the capital," the Associated Press reported on Monday. In the United States, fearful that the public might think that journalists had ties to law enforcement, the National Association of Black Journalists once banned the FBI and CIA from its job fairs. However, officials said they were told they could not legally ban them and the agencies returned. "The U.S. State Department is offering $1.2 million to bring 75 to 100 Cuban high school students to the United States for 'summer leadership' sessions," Juan O. Tamayo reported Sunday for the Miami Herald. Tamayo also wrote, "The College of Communications at California State University, Fullerton, will have a number of Cuban university students participating this summer in specialized workshops on digital journalism, Dean William G. Briggs said in May. 'When you consider that Cuba’s a closed society, and that their idea of journalism, since 1959, has been to just basically spout the party line and say whatever Fidel [Castro] wanted them to say, the idea that they are going to come to the United States and learn modern digital communication techniques that they can take back with them, this is going to represent a very serious, major crack in the dam,' Briggs said. 'And the Cuban government knows that. But they also know that they have to modernize their society. ' . . . "
The NPR show "State of the Re:Union" explored how Hawaii is still navigating the legacy of sugar plantations, and why Dr. Keanu Sai, a native Hawaiian and an expert in land titles, came to believe that Hawaii was illegally coerced into becoming a state. Reporting on Libya, Reporters Without Borders said Monday it was "shocked to learn that Naseeb Miloud Karfana, a TV journalist based in the southern city of Sabha, was murdered on Thursday 29 May. Her body was found together with her fiancé's in the city's northern Al-Hay Al-Jadida district. Her throat had been cut and she appeared to have been tortured. . . ."
In Indonesia, "The violence that befell four local journalists has become the subject of a documentary titled Kabar, Kubur, Kabur (News, Buried, Blurred), which was released over the weekend," the Jakarta Post reported on Monday. "The first part of the film tells the story of Didik Herwanto, a photographer with the Riau Pos who was beaten by Indonesian Air Force Lt. Col. Robert Simanjuntak when trying to take a picture of a Skyhawk fighter jet, which crashed in Riau in 2012. . . ."
"A group of Sudanese journalists on Sunday organised a sit-in in front of the National Press and Publications' Council in Khartoum in protest against the government's media policies," Radio Tamazuj reported Monday. The journalists "submitted a strongly worded memorandum to the Press Council calling for immediate intervention to protect newspapers against the 'vicious and systematic attacks' by National Intelligence and Security Services (NISS), and to cancel the suspension of several journalists. . . ."